LC/DBM provides landscape contractors with Educational, Imaginative and Practical information about their business, their employees, their machines and their projects. 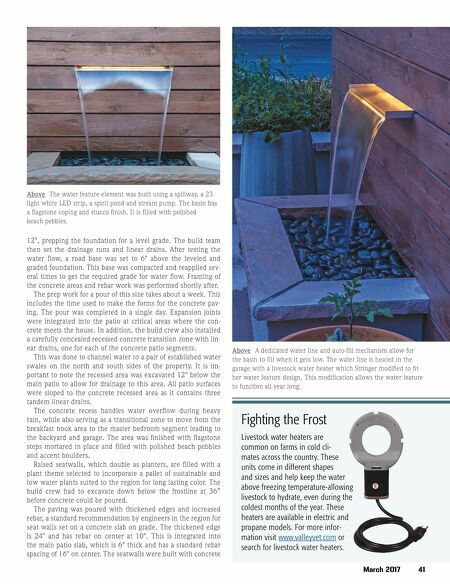 March 2017 41 Above The water feature element was built using a spillway, a 23 light white LED strip, a spirit pond and stream pump. The basin has a flagstone coping and stucco finish. It is filled with polished beach pebbles. 12", prepping the foundation for a level grade. The build team then set the drainage runs and linear drains. After testing the water flow, a road base was set to 6" above the leveled and graded foundation. This base was compacted and reapplied sev - eral times to get the required grade for water flow. Framing of the concrete areas and rebar work was performed shortly after. The prep work for a pour of this size takes about a week. This includes the time used to make the forms for the concrete pav - ing. The pour was completed in a single day. Expansion joints were integrated into the patio at critical areas where the con - crete meets the house. In addition, the build crew also installed a carefully concealed recessed concrete transition zone with lin - ear drains, one for each of the concrete patio segments. This was done to channel water to a pair of established water swales on the north and south sides of the property. It is im - portant to note the recessed area was excavated 12" below the main patio to allow for drainage to this area. All patio surfaces were sloped to the concrete recessed area as it contains three tandem linear drains. The concrete recess handles water overflow during heavy rain, while also serving as a transitional zone to move from the breakfast nook area to the master bedroom segment leading to the backyard and garage. The area was finished with flagstone steps mortared in place and filled with polished beach pebbles and accent boulders. Raised seatwalls, which double as planters, are filled with a plant theme selected to incorporate a pallet of sustainable and low water plants suited to the region for long lasting color. The build crew had to excavate down below the frostline at 36" before concrete could be poured. The paving was poured with thickened edges and increased rebar, a standard recommendation by engineers in the region for seat walls set on a concrete slab on grade. The thickened edge is 24" and has rebar on center at 10". This is integrated into the main patio slab, which is 6" thick and has a standard rebar spacing of 16" on center. The seatwalls were built with concrete Fighting the Frost Livestock water heaters are common on farms in cold cli- mates across the country. These units come in different shapes and sizes and help keep the water above freezing temperature-allowing livestock to hydrate, even during the coldest months of the year. These heaters are available in electric and propane models. For more infor- mation visit www.valleyvet.com or search for livestock water heaters. Above A dedicated water line and auto-fill mechanism allow for the basin to fill when it gets low. The water line is heated in the garage with a livestock water heater which Stringer modified to fit her water feature design. 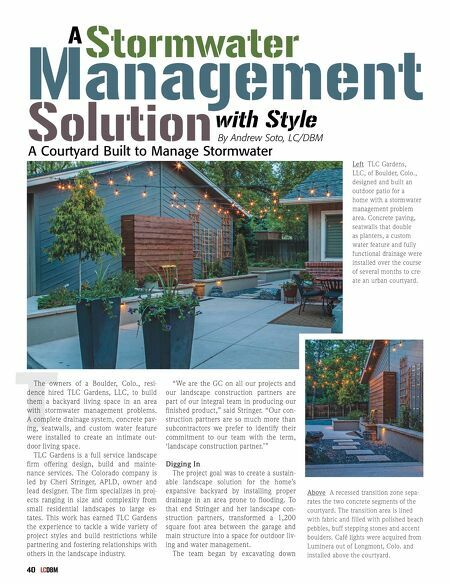 This modification allows the water feature to function all year long.